The umbilical cord is the connecting cord from the developing embryo or fetus to the placenta which allows blood to carry oxygen and nutrition to the baby in the womb. After the baby is delivered, the umbilical cord is cut and normally discarded with the placenta as medical waste until researchers became aware of its medical potential. Along with banking the cord blood itself, families now have the option to also bank a section of the actual tissue that makes up the umbilical cord. Umbilical cord lining is the membrane that covers the umbilical cord. As with cord blood, the collection process for Cord Lining is fast, easy, and painless. The umbilical cord contains high numbers of Epithelial (EpSCs) and Mesenchymal (MSCs) stem cells which have shown immense potential in aiding the repair of injured tissues and organs and the treatment of various diseases. EpSCs form the soft tissues that connect, support, or surround other structures and organs of the body including cornea, skin, and liver. MSCs are the building blocks of structural tissues of our body such as bone, cartilage, muscle, fibrous tissues and fat. When you bank the umbilical cord lining, you are saving the skin-forming and muscle-forming stem cells found in it. In contrast, when you bank cord blood, you are saving the stem cells found in it which are mostly hematopoietic (or blood forming) stem cells. 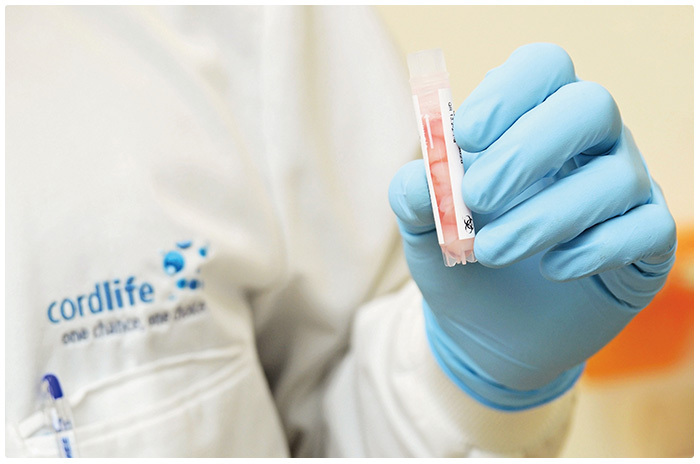 Storing both cord blood and umbilical cord lining will allow maximum recovery of all types of stem cells, thus increasing one’s options for possible therapeutic applications in the future. The patented technology provided by Cordlife allows isolation and expansion of EpSCs and MSCs, two types of stem cells found in the umbilical cord lining but not present in cord blood. By storing a combination of HSCs, MSCs and EpSCs, you are availing your child to be part of a medical revolution with the access to the growing applications of stem cells and the therapeutic potential that they hold. These cells, being able to be collected at birth only, are the youngest and most potent cells available. Today, more than 190 clinical trials1 are on-going worldwide to uncover the potential of MSCs. Thus far, encouraging results have been published; stem cell treatments have been proven safe and capable of repairing damage caused by stroke and heart disease. MSCs have also been used in combination with HSCs as a dual therapy to promote faster engraftment of HSCs and to reduce immune system complications2. Battiwalla M, Hematti P. 2010. Cytotherapy. 1 January 2010.